O’Keeffe wasn’t the only one: Between the world wars, New Mexico was a hotbed of American modernism. That legacy is the subject of two major museum exhibits in Santa Fe. Above: Andrew Dasburg, Sangre de Cristo, circa 1933, watercolor, 15 1/8" x 21 5/8". Collection of the New Mexico Museum of Art. Gift of Mr. Edwin F. Gamble, 1968 (2235.23P). Photo by Blair Clark. The New Mexico Museum of Art, a beautiful early example of Spanish Pueblo Revival architecture built in 1917, is right off Santa Fe’s historic Plaza. The Georgia O’Keeffe Museum, the world’s largest single repository of the revered artist’s works, is one block away. Single-price tickets to all the associated exhibits are available at fallofmodernism.org and at both museums. Now through January 17, 2016 New Mexico Museum of Art O’Keeffe in Process and Looking Forward/Looking Back, an exhibit inspired by O’Keeffe and focusing on works in the museum’s collections by significant women artists. Ten commercial galleries in the downtown area and on Canyon Road are participating in the event with modernist shows of their own. For more info, visit fallofmodernism.org. IN THE WINTER of 1913, at the 69th Regiment Armory in Manhattan, an immense exhibition of European and American avant-garde creations introduced American viewers to astonishing new modes of thinking about and executing works of art. At the groundbreaking Armory Show, pictorial realism yielded to Post-Impressionism and various forms of abstraction, including Cubism, Fauvism, and Futurism. Among the participants were Andrew Dasburg, Stuart Davis, and Marsden Hartley, who found their way to New Mexico over the next few years, during the later 1910s and ’20s, to paint its haunting landforms and townscapes, as well as pueblo pottery, kachinas, and sacred feasts and dances. By 1918, New York heiress Mabel Dodge, who’d energetically promoted the show, had begun her transformation as Taos art colony patron (she married Taos Puebloan Tony Luhan in 1923), beckoning international big-city artists, writers, and intellectuals to take part in her influential northern New Mexico circle. American modernism had its roots in late-19th-century Europe, where painters struggled to make sense of the dehumanizing conditions brought about by the Industrial Age. Some artists associated with this country’s movement—generally recognized to have been fully realized between the two world wars—were European immigrants or first-generation Americans who deeply appreciated the expansiveness of their adopted homeland. Their quest to develop a new vernacular of abstracted forms of art that declared an abandonment of traditional techniques, subjects, and belief systems led many of them to New Mexico, where the landscapes, architecture, and Native peoples (with their own art forms) were conducive to such explorations. Georgia O’Keeffe first visited New Mexico in 1917 on a road trip from Texas, where she was teaching. Seeking artistic inspiration, she returned in 1929, at Dodge’s invitation, beginning a 20-year pattern of spending summers in New Mexico before relocating in 1949 from New York to the Abiquiú area, after the death of her husband, photographer-gallerist Alfred Stieglitz. French-born Andrew Dasburg, who immigrated to New York as a child, came to the state by way of Dodge’s hospitality in 1918. He spent plenty of time in New Mexico afterward before settling permanently in Taos in 1930. Czech-born New Yorker Jan Matulka came to New Mexico in 1917, finding pueblo life particularly inspiring. So did Maine artist Marsden Hartley, who visited in 1918, writing about the Native cultures’ approximation of the “universal ideal” and reporting he was “bewitched” by the “magnificence and austerity” of the arroyos and canyons and their “sculptural” forms. “It is of course the only place in America where true colour exists, excepting the short autumnal season in New England,” he added. East Coast painter-printmaker Stuart Davis came to the state once, in 1923. Though he found the region’s vastness and drama overwhelming, his visit inspired several significant abstract oils. All these sojourns resulted in major New Mexico pieces that enjoyed heavy rotation in the Manhattan venues of Stieglitz and other forward-thinking gallerists. To celebrate this legacy, curators at Santa Fe’s Georgia O’Keeffe Museum and the New Mexico Museum of Art joined forces to organize Fall of Modernism: A Season of American Art, a slate of three ambitious exhibits ending in January and February that center on the significant innovators and works of the American modernist movement. O’Keeffe’s Abiquiú and Ghost Ranch pieces figure prominently, and more than a third of the art in these exhibits, some of it photography, depicts New Mexico scenery or pueblo life. 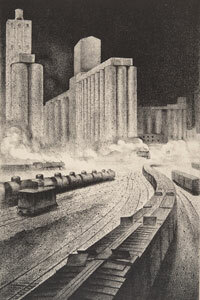 Louis Lozowick, Untitled, 1933, lithograph, 12 3/4" x 8 1/8". Collection of the New Mexico Museum of Art. Bequest of Vivian Sloan Fiske, 1978 (4376.23G). Photo by Blair Clark, © Louis Lozowick Estate. The exhibit includes New Mexico landscapes by Dasburg and Davis and a stunning Hartley still life, El Santo, a 1919 oil that’s at once somber and resplendent, along with a 1939 lithograph, Christmas Eve, Taos Pueblo, by Helen Blumenschein (daughter of Taos artists Ernest and Mary), and Tribal Rites III, a delicately tinted abstract watercolor from the same period by the New Mexico−based painter Gina Knee. Some of the two-dozen-plus black-and-white photographs in An American Modernism feature striking scenes from New Mexico, including Paul Strand’s Badlands Near Santa Fe, from 1930, and Edward Weston’s Windmill, New Mexico, taken seven years later. There are three Ansel Adams works and Margaret Bourke-White’s 1938 image of rows of shells at the Skoda munitions factory in Pilsen, Czechoslovakia. Several of Stieglitz’s celebrated cloud studies, made in the 1920s and ’30s and known collectively as Equivalents, are included, along with works by noted photographers Ralph Steiner, Berenice Abbott, and Willard Van Dyke. Russell Lee and Walker Evans, both known for their social documentation of the Great Depression, are represented. An ethereal portrait of a bulto, positioned in front of a retablo, that was taken in Trampas in 1939 by John Candelario, a seventh-generation New Mexican, is especially riveting. This year the Museum of Art is showing all its O’Keeffe holdings simultaneously, for the first time. An American Modernism includes two of them, and the remaining nine are on display at the institution’s other Fall of Modernism show, O’Keeffe in Process, where visitors will learn about the artist’s working techniques. Most of the latter exhibit’s pieces and associated studies and reference materials have been borrowed from the nearby O’Keeffe Museum, which loaned out more than a third of its 140 paintings, along with related drawings, photos, ram’s horns, and bones. Carmen Vendelin, that show’s curator, shines a spotlight on O’Keeffe’s creative process over half a century as she developed into the most commercially successful female artist in history. The earliest works, from 1905, are portraits of family members. “You can see her starting point, and you can see her career trajectory,” Vendelin says. One of the reasons O’Keeffe gravitated to New Mexico, as opposed to, say, Europe, was her fear of flying. But later in her career, after 1959, when she finally did go up in a plane for a globe-spanning journey, she started doing canvases “that were like aerial maps of landscapes—very schematic,” Vendelin says. 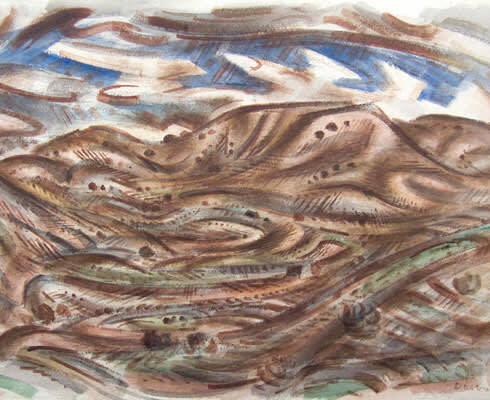 “It’s almost the opposite of her earlier cropped, enlarged views.” The show has two works depicting the Chama River, one as seen from above, along with associated drawings. The Georgia O’Keeffe Museum’s From New York to New Mexico: Masterworks of American Modernism from the Vilcek Collection shows 65 pieces, many of them New Mexico−centric. It’s a meaningful affiliation: Based in New York and originally from Czechoslovakia, the collectors, Jan and Marica Vilcek, began making their purchases during visits to Santa Fe that started in the 1980s. The first piece they bought was a Stuart Davis canvas from the Owings Gallery, 15 years ago. The Vilceks own five O’Keeffe works, including a spiral sculpture based on a ram’s horn, a 1931 oil, Kachina, inspired by a gift from Paul Strand, and two New Mexico canvases, one a landscape and one architectural. The Vilcek Collection, considered one of the finest groupings of American modernism, is rich in the artists Stieglitz championed, the ones who influenced O’Keeffe the most. “She becomes even more interesting, more relevant, when you see her in the context of her times—in that milieu,” says curator Hartley, who augmented the Vilcek O’Keeffes with some of the museum’s own holdings. Other pieces of note in the show, dating from the 1910s and ’20s, are Marsden Hartley’s Indian Pottery, an exemplary still life showcasing a polychrome Acoma jar, and abstract paintings from his New Mexico Recollection landscape series; Indian Family and Indian Corn, two flat, posterlike Davis works that seem to borrow their simple, strong lines and color from advertising; a stunning Cubist study of downtown Taos adobes, as well as a santuario, by Dasburg; and an exquisite (if incorrectly titled) gouache on paper, Mexican Statuette, by Russian Brooklynite Max Weber, which depicts a rather sassy-looking Cochiti clay figurine standing before a pot, most likely from Zuni Pueblo. (The artist would have seen such pottery in Manhattan, at the American Museum of Natural History.) Fall of Modernism gives art lovers a chance to see three Matulka pieces, including the dynamic Indian Dancers. Just a block over, at the Museum of Art, you can see its companion piece—the brightly colored Cubist oil Pueblo Dancer (Matachina) from the same 1917−18 period.